Hello, PlayStation nation! Today, we’re very excited to announce that Deus Ex: Mankind Divided will be launching on PS4 on February 23rd, 2016. The team has been working hard on the game, and even if its release is still a few months away, having a set date where we know you’ll get a chance to experience the game first hand is a huge motivation for all of us. 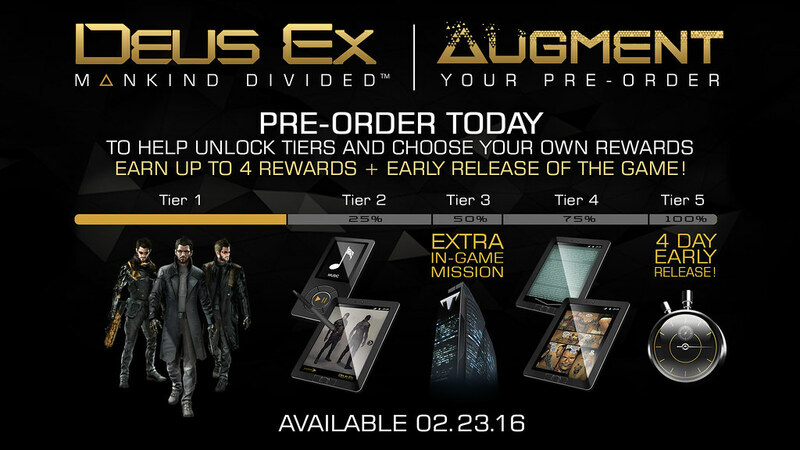 In the spirit of player choice, which is at the heart of Deus Ex, we’ve put together a special program called “Augment your Pre-order”. It will let you choose the digital pre-order bonuses you want to get for your Day One edition of the game, selected from five different tiers which will unlock progressively. You can of course take part in this program by pre-ordering the game through PlayStation Store. The available rewards within each tier include in-game items packs, digital books and music expanding on the world of Deus Ex: Mankind Divided, and an extra in-game mission. The very last tier is one of a kind, as its reward will be an early release of the game, four days prior to its scheduled launch! For more details on Augment your Pre-order, check out the official site. If you want everything, we’ve also got your covered. 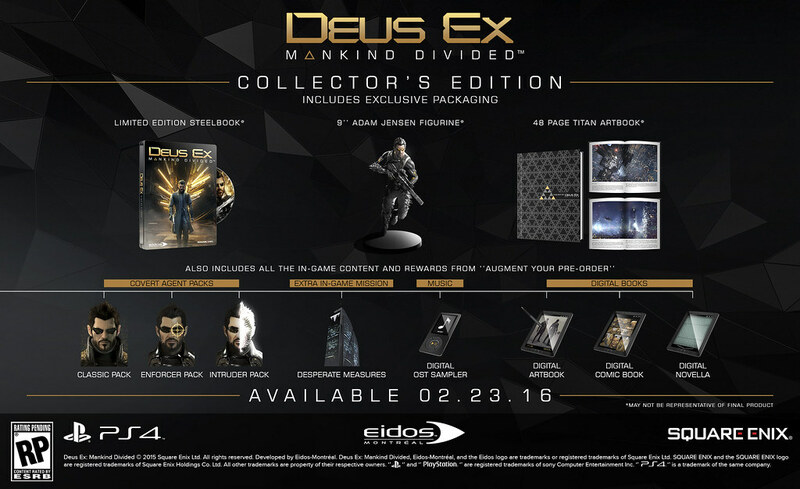 The Collector’s Edition for Deus Ex: Mankind Divided will include all the in-game content and rewards from Augment your Pre-order, as well as physical items, selected based on the thousands of votes you submitted to us during our community vote for this edition. The aforementioned physical items include a 48-page artbook created in partnership with Titan Books, a 9″ Adam Jensen figurine, a limited edition steelbook and, of course, the Day One edition of the game — which will all come in an exclusive packaging. We can’t wait for you to experience Deus Ex: Mankind Divided. In the meantime, keep an eye out for more information and reveals in the coming months! As for the game potentially shipping early, that’s cool, but hopefully most of the bugs will be ironed out and that the day 1 patch (which I’m sure will come) will be ready for that early date too if need be. Anyways, really pumped for this! Very excited for this! Played it DE:HR on both PC and PS3 and couldn’t get enough. Happy to now put this date on my calendar! Not getting to excited about when this is coming out because delays are part of the business. Came here all excited to watch a trailer and all I get is some BS preoder bonus video…. Is this really what pre-ordering games has come to? I like Deus Ex but I can’t support this. I love the Deus Ex games, but this tiered pre-order idea is a disincentive, not an incentive. I’m much less likely to pre-order the game now. Well, under no circumstance should we support this kind of thing, or it’ll only get worse. Stand together on this one, folks, we can’t reward any publisher for doing things like this. This pre-order nonsense is garbage. “Thanks” for allowing me to choose which content I’m NOT getting when I buy this game. Eidos You’re making me nervous that’s one hell of a early release date even some indie games that been announced months and even a year ago aren’t even out yet . I love this series, but this pre-order nonsense is garbage. This would normally be a day 1 purchase, but I can wait until the ultimate edition is released a year later, on discount, from Steam. I’m as excited for the game as I am frustrated with their preorder campaign. It’s the worst I’ve seen since Watch Dogs. It basically punishes you for not preordering the game. Worst preorder campaign. Showing your customers that money means more then satisfying your customers.No way i’m going to support this. No going to preorder. I’ll wait. When I see preorder garbage like this. Not only do I not preorder, it sours any interest I may have had in the game at all. Likely wont even buy after release. I’ll be waiting for the GOTY version, where all the content will actually be on the disc. This pre-order DLC b.s. is hot garbage. Why it’s not on the Vita? No thanks. I know you guys want to ensure people buy your game but this is not the way to do it.